Note: LPR refers to lawful permanent resident. DOL methodology to estimate the total population of H-2B workers was used to calculate H-2B subtotal. All references to a particular year should be understood to mean the U.S. government’s fiscal year (October 1–September 30). Adjustment of status for H-2A based on actual numbers for 2014 and and H-2B based on actual numbers for 2012-2014. 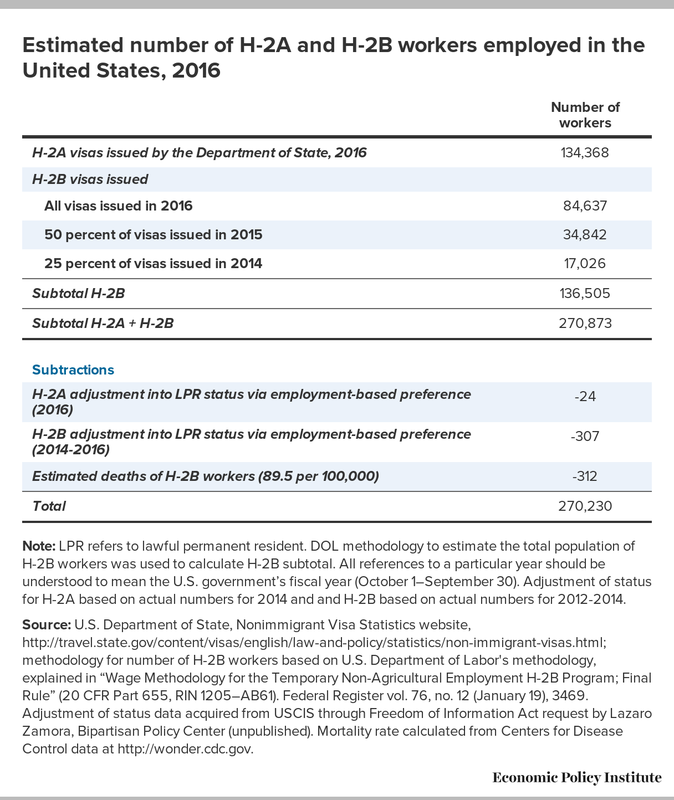 Source: U.S. Department of State, Nonimmigrant Visa Statistics website, http://travel.state.gov/content/visas/english/law-and-policy/statistics/non-immigrant-visas.html; methodology for number of H-2B workers based on U.S. Department of Labor's methodology, explained in “Wage Methodology for the Temporary Non-Agricultural Employment H-2B Program; Final Rule” (20 CFR Part 655, RIN 1205–AB61). Federal Register vol. 76, no. 12 (January 19), 3469. Adjustment of status data acquired from USCIS through Freedom of Information Act request by Lazaro Zamora, Bipartisan Policy Center (unpublished). Mortality rate calculated from Centers for Disease Control data at http://wonder.cdc.gov. Note: LPR refers to lawful permanent resident. 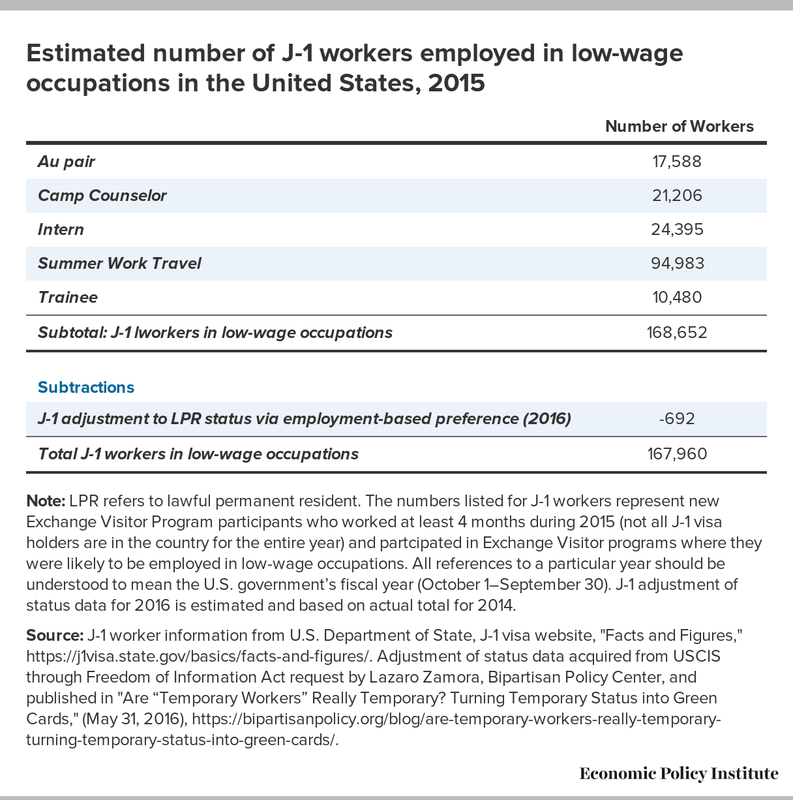 The numbers listed for J-1 workers represent new Exchange Visitor Program participants who worked at least 4 months during 2015 (not all J-1 visa holders are in the country for the entire year) and partcipated in Exchange Visitor programs where they were likely to be employed in low-wage occupations. All references to a particular year should be understood to mean the U.S. government’s fiscal year (October 1–September 30). J-1 adjustment of status data for 2016 is estimated and based on actual total for 2014. 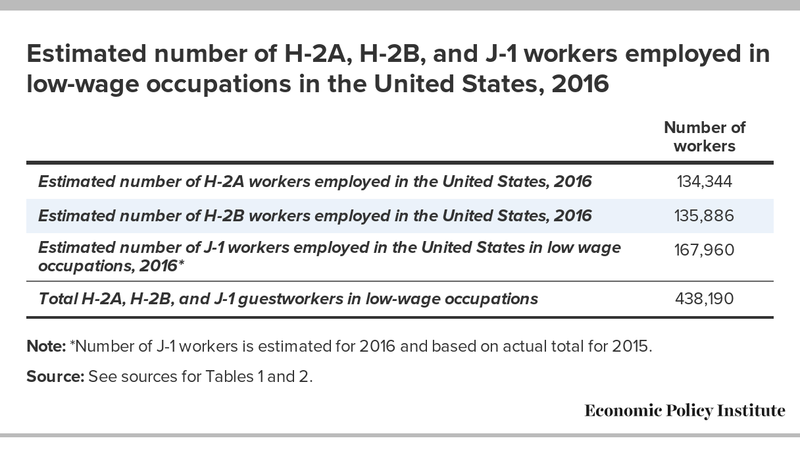 Source: J-1 worker information from U.S. Department of State, J-1 visa website, "Facts and Figures," https://j1visa.state.gov/basics/facts-and-figures/. Adjustment of status data acquired from USCIS through Freedom of Information Act request by Lazaro Zamora, Bipartisan Policy Center, and published in "Are “Temporary Workers” Really Temporary? Turning Temporary Status into Green Cards," (May 31, 2016), https://bipartisanpolicy.org/blog/are-temporary-workers-really-temporary-turning-temporary-status-into-green-cards/. 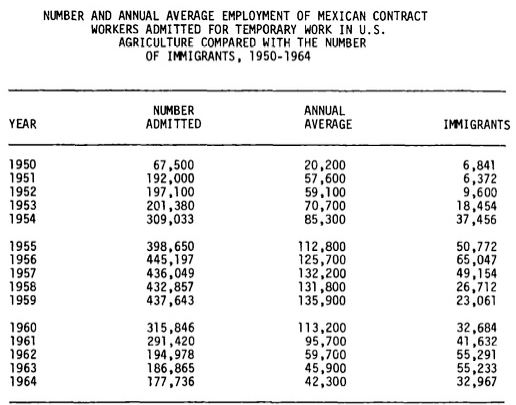 Note: *Number of J-1 workers is estimated for 2016 and based on actual total for 2015. Source: See sources for Tables 1 and 2. Both Democrats and Republicans seem to have a soft spot for employers seeking low-wage guestworkers. At a recent hearing, Republican Governor Sonny Perdue and Democratic Senator Kristen Gillibrand discussed and described the H-2A program as too “cumbersome” for farm employers, even though there is no limit on the number of H-2A workers they can hire and DOL has processed 99 percent of applications in a timely way in 2017. Low-wage nonfarm employers persuaded 32 legislators to sign a bipartisan letter asking the Department of Homeland Security (DHS) to audit the H-2B program in an effort to build support to expand the program (by exempting returning workers from the 66,000 a year cap). Republican-sponsored legislation to do just that—exempt returning H-2B workers from the annual cap—was introduced in the House this month, with two Democratic co-sponsors.